Deemo is a mobile music game developed by Taiwan’s Rayark. Its IOS version was published in January, 2013, with Android version followed a month later. In 2015, its PSVita version released. Deemo builds a quiet and mystery world for its characters, and for its players. Players have to play songs to develop the storyline and speculate the story plots from dubbed animations and tiny changes in the game’s world. Deemo cooperates with certain indie musicians to provide exquisite original music in the game. It produces a feeling of healing, touching and peace through its music and story. It is not quite popular but has certain die-hard fans in China. The rules in Deemo are quite simple. Players play piano songs just like playing the piano — click on certain position at certain time point. After finishing a song, accuracy rate, grade and some other judgements would be given, along with a new height of the tree, which plays a significant role and implies the total score in the world. With the tree height increasing, the story goes on, with more songs unlocked and more rooms accessible in the world. Players can explore the rooms and unlock hidden songs as well. In Deemo, there are only 3 characters, and none of them can speak, one of them does not have a specific appearance, one of them always veils her face. The only way for players to get the story is to watch the dubbed animations, to look out tiny changes after playing certain songs and to combine them with own imagination. The story starts in a lonely piano hall, with only a piano and a dumb man in black named Deemo. Unexpectedly, a girl falls in the hall all of a sudden. Deemo catches the girl and keeps her company with his piano melody in the following days. In the meanwhile, a sapling appears in the hall center. Days after days, with the piano melody (played by game players), the sapling grows. Things start to change quietly in the hall. One day, a path comes into existence, leading to a small study, filled with old books and with a veiled girl seated in the midst. Other rooms become accessible afterwards. When the sapling grows into a 14-meter tree, strange broken glass appears. It never grows taller after 20m. There is no obvious conflict in the story. Actually, no clear story is given. Events are unfolded linearly with the progress of music playing. Author tells the story slowly and imaginably, as an interaction with the players. The story tension is moderate and the imaginary space attract players further. 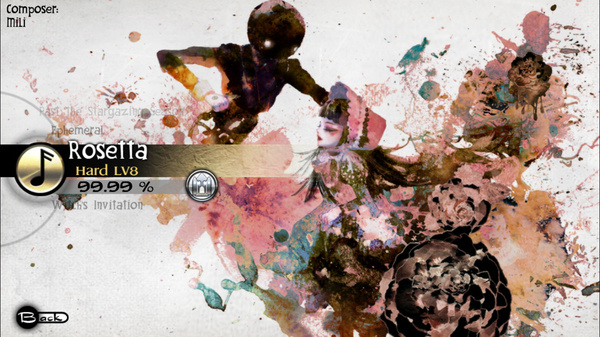 One of the brightest attractive points for Deemo is its aesthetic, namely, its music, scene and interface. First, as to the music, all of the piano songs in Deemo are original. Rayark (the producer of Deemo) cooperates with a number of distinguished indie musicians to provide exquisite music in the game. Music style differs from each other but matches current stroy plot, and are divided into different packages, with different illustrations. Second, the scene in Deemo is attractive. For one thing, it combines some not fashion drawing styles like abstractionism and Baroque, creating a mystery quiet world different from common games for players. For another, every song has its own illustration, which matches the melody style and current story plots well. Third, the interface of Deemo has achieved much praise. Its interface is simple, clean and clear. Players would feel comfortable and fluent in operation. Actually, technology does not play a vital role in Deemo. There is no VR, no AR, no sensors and even no modelings. The most “tech” part for the game may be the beats recognition, which is set manually. Unlike common music games, it provides a long-time recognition of each beat click, giving promise to a more accurate judgement for player’s performance. A most appealing point of Deemo is its ambiguous, imaginable and gradually progressing storyline. At the very beginning of the game, the girl falls and Deemo catches her. Players just know something unusual happens but not clear about it at all. Then, the story develops with the tree grows. Some telling details emerge as well. Players play the game to know more about the story, and speculate the story from the tiny details and dubbed animations. Their curiosity on the story impels them to continue the game. Deemo offers nice experience for players. Psychologically, as mentioned above, Deemo provides a sense of healing and peace through its stories and its music. Different from some popular mobile games on the market which pursue high complexity and make players addicted and frustrated, Deemo is a nice way of relaxation for users. Physically, the rules and interface of Deemo create great user experience. Some mobile music games require delicate operations, which means players would get much better experience on iPad and some other tablet computers. However, such problem does not happen in Deemo, since Deemo does not distribute certain place for certain key, but each key drops to a wide (possibly overlaps other) key range for players to click on, which made it convenient and comfortable to manipulate on phones. As a music tempo game, Deemo definitely require certain skills. Deemo requests basically 3 skills for players: tempo sensitivity, response agility and finger flexibility. Moreover, as mentioned in the technology part of elemental tetrad, Deemo has a more precise judgement system on players, which means it has higher demand on players’ skills. The world in Deemo is a world of fantasy with classical music, grand piano and delicate decoration. With the story developing, it shows other fatastic rooms for players. Also, with more and more story plots emerging, the complete story emerges. 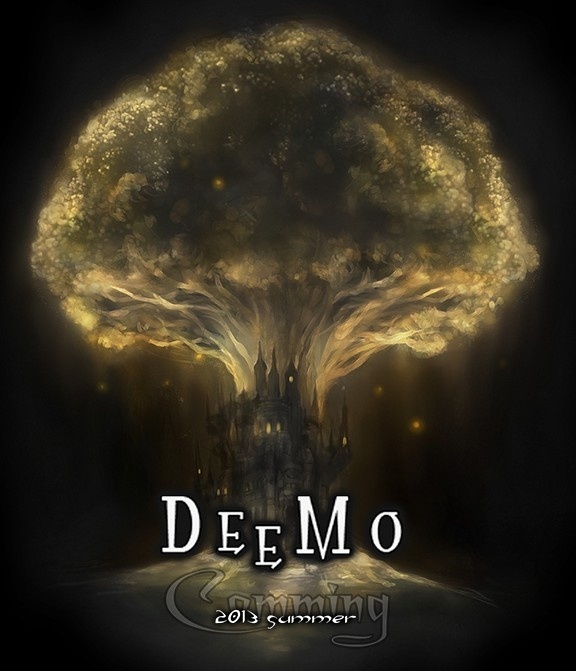 Each player has his own guess and story about Deemo. Most regard Deemo’s world a dreamland of the girl or Deemo. Deemo’s world is a fantasy world in name and in fact. A 4X turn based sci-fi game where multiple sponsors (civilizations) land colonies on an alien planet in a bid to escape a post-apocalyptic Earth. Subsequently, these sponsors compete to realize their vision of a new idealized humankind by defeating their competitors militarily or discovering and achieving one of four different philosophical objectives to advance humanity beyond its earthbound form. The essence of the game is to land on an alien, unknown planet, then use its unique resources with your unique leader abilities to achieve success. By studying futuristic technologies and making branched decisions, each civilization will attain affinity experience from one of 3 unique philosophical affinities. This affinity ultimately improves their civilization and their military units visually and game-play-wise. Every turn taken brings the civilization one step closer to a new technology/civic/building/unit that could boost the player’s game-play, thus encouraging the player to use these improvements to advance the civilization to gain even more or better technologies/civics/buildings/units. This creates an effort/reward cycle that creates immersion. This game implements a then new diplomacy system where different players can enter into diplomatic agreements with each other where the nature of the agreements depend on the leaders’ unique abilities and non-preset personality traits players acquire mid-game depending on their play style or immediate needs. Even the AI controlled civs like or dislike you based on these personality traits. This allows different players to enter into alliances during game-play where each player’s unique play style are apparent. The entire game map usually starts out unknown to all players and each player has limited vision depending on how many cities and units they have and where they are located. Thus, the player will inevitably occur positive surprises, like resource pods or resource rich locations, as well as negative in the form of hostile alien nests and unexpected terrain obstacles. This game has 2 main forms of collectibles: artifacts and quest objectives. Collecting artifacts and activating them in sets of three gives civilizations unique buildings or abilities that give them unique advantages. Achieving quest objectives grants the player additional story information that gives additional context to the game world, some quantitative reward, and implicitly guides the player to take actions that improves game play. To maximize game play advantage, the player has to solve problems like where to settle cities, which technologies and civics to research and what to focus city production on. The correct decision to take is never fixed due to variables like surrounding resource nodes, each civilization’s unique abilities and what the other civs are doing. At the beginning of the game, all civilizations start out looking like standard space explorers. As they advance technologically and devote themselves further into the in-game affinities, their cities and units visually to reflect this. To support the sci-fi alien theme, players research highly abstract technologies while fending off hostile native aliens, researching abandoned ruins that once belonged to an alien civilization and even contacting them with a contact beacon as a win condition. Due to the desire of players to focus on more than one affinity, hybrid affinities with their own perks and aesthetics were introduced in a subsequent expansion. The story features a select few human colonies leaving behind the rest of humanity on a post-calamity Earth after an event known as “The Great Mistake” hampered Earth’s ability to support life. After they settled the new alien planet, the civilizations that sprang from these colonies pursued the ideological affinities of technological Supremacy, cultural Purity or biological Harmony to rectify their past world’s mistakes. The victory conditions of building unique affinity wonders that aim to achieve each affinity’s ultimate goal is in service to this story. 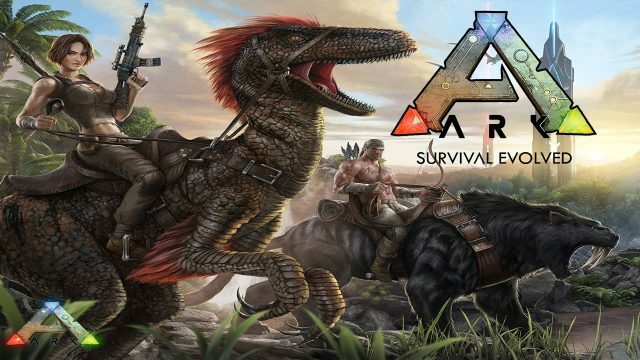 Ark: Survival Evolved is an open world survival RPG based on an island full with dinosaurs. The user starts out stranded on an island and has to learn to survive on the island. As you level up, you unlock blueprints to craft equipment aiding in housing, combat and also dinosaur taming. There is no explicit goal and the player determines his own objective from building giant fortresses to exploring every caves on land or underwater and even being a dinosaur breeder. The game offers choice of official PVP, official PVE, player-owned and solo servers to let players play according to their taste. Aesthetics: The game is in 3D with realistic artwork ranging from the island to water effects and also heavy emphasis on limited lighting when night time comes around. This lends to the feel of actually being stranded during the first few in game days of play when you can only craft a wooden torch for lighting and have limited sight range during the nights. Technology: Ark: Survival Evolved is made using Unreal Engine 4 to deliver realistic graphics and also has VR support. The developers also allow players to utilize Unreal Engine 4 Editor to create additional content and mods for the game. 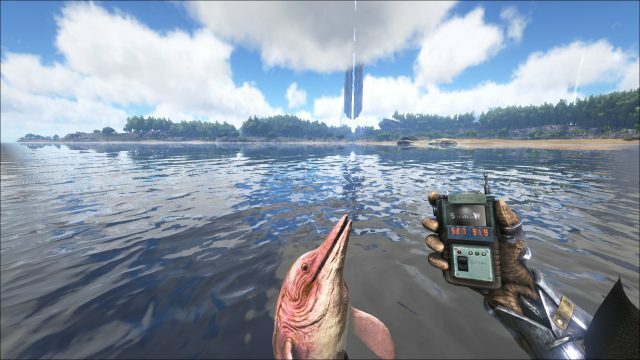 Mechanics: The player not only has health and stamina like standard RPGs, some unique attributes to Ark includes hunger, hydration, warmth and oxygen. The game tries to include realistic aspects of life with limited technology at the start: harvesting wood and stones to make your first set of tools like hatchet, pickaxe and spear for self-defense; harvesting bamboo and wood to build your first hut; killing fishes or dodos and even dinosaurs for meat and cooking them on campfires for sustenance. As player levels or explore, they unlock blueprints for advanced technology and eventually are able to utilize modern technology like GPS, auto-turrets and electrical appliances like lamp posts, refrigerators and lamp posts. Story: There isn’t much story other than the player being stranded on an island trying to survive. The player determines their own story be it being an explorer, a builder or dinosaur tamer. In PVP servers, there are aspects of territorial control and invading other tribe’s fort to loot their spoils or staying on the low and settling down in areas with heavy foliage to avoid other players. Ark: Survival Evolved revolves heavily around dinosaurs and mythical creatures. There are 142 different creatures reported, with 119 of them released as of this review. Some of the well-known ones included the triceratops, T-rex, mammoth, Yeti and even sea creatures like Megalodon. The different creatures have different levels of aggression ranging from passive and are okay with you getting close to extreme aggression where they will try and eat you upon sighting you. Most of the creatures can be tamed by knocking them out through tranquilizers and tamed with food. The larger creatures can be equipped with a saddle once tame to allow you to mount them. There are flying and sea-dwelling creatures, a vast variety. Lens of Curiosity: The user starts out with nothing and can see maybe a few different creatures near their spawn location. However, survival is of priority and the player is restricted to keeping themselves alive first. The player is able to swim near the shore as much as his oxygen allows and catch fish for food. It is possible to see Ichthys (dolphin-like creatures) swimming near the shore and circling the player playfully or meet hungry man-eating piranhas that attack you. Also, you can see creatures flying about in the air and also notice that the areas you explore on feet is extremely small in comparison to the in game world. This teases the player to level to reach a point where he can survive comfortably and tame dinosaurs to let him explore the land faster making use of the speed of various tameable creatures to fly from point to point. If dinosaur taming is too tough for the player, they can unlock blueprints for the raft early on in the game and explore the perimeters of the island by sea or even check out smaller islands nearby to harvest resources or just to sight-see. Lens of Triangularity: High risk, high reward and low risk, low reward is a huge aspect of the game regardless of server choice. While the player can choose not to tame dinosaurs, the player will have limited carrying capacity and strength. This limits how fast the player can gather resources and bring back to fortify their base or further research. 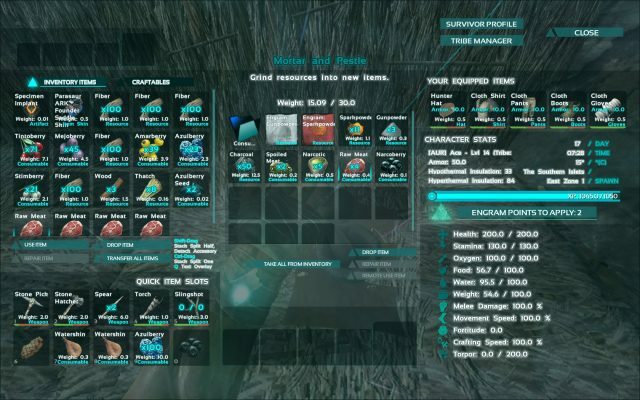 With creatures, players can share the load of the resources between themselves and their mounts, also, some creatures like the triceratops are capable at gathering berries, allowing them to harvest multiple times faster than by hand. Even in choosing which dinosaur to tame, to get a stronger tame, you have to be able to knock out the creature first. One of the best tameable creature is the Giganotosaurus (players call it Gigan in game). It is 25 times more durable to tranquilizers than the triceratops at level 1, becoming even more resistant as its level increases. On top of taking a long time to tame and having to try and survive while taming it, the aggressive nature of the dinosaur maintains even after being tamed. If a player’s Gigan takes too much damage, it can go into Rage mode, flinging it’s rider off and dealing increased damage to any living things near it for 20 seconds, regardless if they are ally or foe. Lens of Freedom (#79): Ark is open-world without an explicit goal for the player. A common way for players on cooperative servers to collaborate is through having players doing specific set of jobs. Those who are more into taming dinosaurs will help tame dinosaurs for the tribe for various purpose. 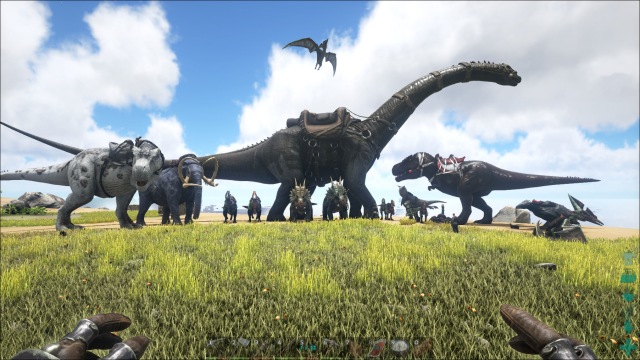 Those who are interested in crafting and gathering can bring these tamed dinosaurs out to gather resources like metal, gold or oil and create building components for the builders. The players who are more interested in building can then take these components and improve the fortress to house more dinosaurs or provide more comfort for the tribe’s characters. In fact, a player can choose to do any of the above mentioned task, albeit this means that progress in any aspect will be slower since the player has to improve each and every aspect. Player made content via UE4 editor can be uploaded on Steam Workshop for downloads and it ranges from new structures to sounds and game mods. Lens of Risk Mitigation (#16): As much as this game has a great concept and won various awards, the developers, Studio Wildcard failed to pre-empt optimization problems and also hacking issues. The cost for the realistic graphics took a toll on how smoothly the game runs and there are various reported glitches like dinosaurs clipping through structures or the ground and disappearing or starving to death in inaccessible spots. Also the problem of hacking is not handled well enough to the point that many players have trouble keeping their progress in PVP servers since hackers can level a person’s fort in matter of minutes. While the developers sometimes do mass banning of known hackers, they have not been able to fully prevent hackers from increasing their own damage or enabling god-mode. This makes the PVP component much less enjoyable and kind of restrict the game to cooperative, private or solo servers. Final Fantasy XV is an open world action role-playing video game developed and published by SquareEnix for the PlayStation 4 and Xbox One consoles. The game features an open world environment and action based battle system, incorporating the ability to switch weapons and other elements such as camping and vehicle travelling. Mechanics: The gameplay mechanic of FFXV is an action-based battle system. It is known as the Active X Battle system, designed and directed by Hajime Tabata. 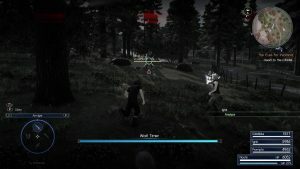 When the player comes into contact with an enemy, an encounter gauge appears on screen, allowing the player to flee before the gauge fills and avoid battle. This made it easy for players who are at a low level, should they encounter a high level monster. There are two modes that the player can choose to experience the battle system, Active and Wait. In Active mode, it is real-time, while in Wait mode, the game suspends the fight and allow the player to select their target enemy or change weapons at their own leisure within the time limit. This appeals to different types of players, and can enhance their experience. 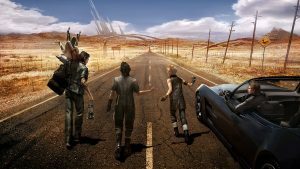 Story: The main story plot told in FFXV is pre-scripted, however since it is an open world environment, this means that the players can progress through it at their own pace. There are also “side” stories to be discovered as the player progresses, through camping/lodgings or side quests. The side stories help to improve the overall experience of the game. Aesthetics: The graphics in this game is stunning and realistic, the surrounding environment has its own characteristics in different areas of the map and the music creates the mood of the situation the player is in, allowing the player to easily immerse themself into the fantasy. Technology: Most cut scenes are rendered to follow the settings of the character the player have chosen. Playable only on PS4 and Xbox One (currently) and not older consoles due to technical troubles. With the exception of the main quests to progress the game, most of the other areas of the game are not compulsory to complete. Instead the player gets to freely choose to do different things; side quests, hunts, camping etc. The game creates the curiosity in players to want to explore the open world environment by rewarding their actions with new recipes, secret quests and additional cut scenes. In my experience of this game, I find my interest curve constantly fluctuating above my “line of boredom”. Just as I think my interest wanes and it is a good time to break, I find myself hooked in again with new information or something else that picks up my interest again. As the game progresses, this curve is gradually increasing, making it harder and harder to stop. However, at the end, while the finale was not a huge disappointment overall, at the point I had reached the end it was not as engaging as the rest of the story had been. The world of FFXV is similar to that of ours, relatable through the use of technology, and also similar to the previous Final Fantasy with recurring creatures, though it is not a requirement to know, can create the sense of nostalgia for fans of the Final Fantasy series. The avatar of FFXV is Noctis Lucis Caelum, heir of the Lucis Kingdom, at the same time, he is just a regular guy who likes to sleep and play mobile games. It is an ideal form where the player can be a prince to a kingdom, and also project themself onto the avatar because of his relatable personality. Dota 2 is a free-to-play multiplayer online battle arena (MOBA) video game developed and published by Valve Corporation. The game is the stand-alone sequel to Defense of the Ancients (DotA), which was a community-created mod for Blizzard Entertainment’s Warcraft III: Reign of Chaos and its expansion pack, The Frozen Throne. Dota 2 is played in matches between two teams that consist of five players, with both teams occupying their own separate base on the map. Each of the ten players independently control a powerful character, known as a “hero”, that each feature unique abilities and different styles of play. During a match, a player and their team collects experience points and items for their heroes in order to fight through the opposing team’s defenses. 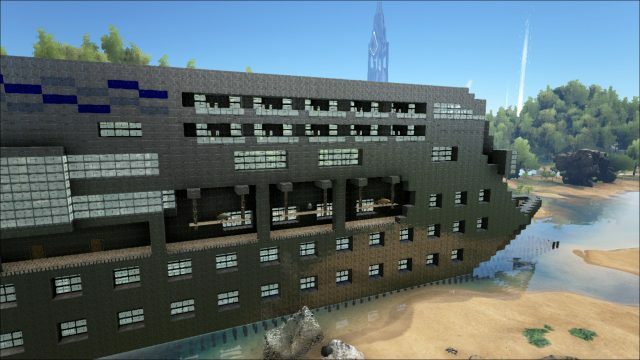 A team wins by being the first to destroy a large structure located in the opposing team’s base, called the “Ancient”. There are around a hundred different characters, or “heroes,” to choose from, and each is uniquely balanced. There are different types of character, from support to full-on attack, and then there are different types within those types. Some are unique in stats and skin only, while others are wildly unlike anything else in the game. Each hero has their own set of moves, and leveling up those moves and using them appropriately is key to winning. Learning how to use various characters and the best path to upgrading them is an important part of MOBA, and it’s the difference between victory and failure. Playing as part of a team is equally vital, and communication is constant and not always flattering. As there are many heroes with different items combination based on the current situation of each game, there are countless possibilities of how the game will proceed every single minute. There are always surprises in every DOTA 2 match. Each game is unique and will bring different situations to the gameplay so that you will not feel boring doing the same repetitive thing over and over again. In DOTA 2, there’s no guaranteed winning even if one team is significantly doing better than the other. Just simply a few combats or strategical plays or individual brilliance can reverse the situation. In DOTA 2, constant practice is required to further improve your skill especially when you just start playing the game. If one puts in a sufficient amount of time to further improve his skill in playing DOTA 2, he can find great joy seeing himself improving from times to times and learn new things along the way. I started playing DOTA 2 4 years ago and i was not good at it in the beginning. However, with constant practice and patience, I’ve found myself improve along the way a lot and now even though I am not the best I could say that I am a pretty decent player in this game and I am happy about it as my effort has shown its worth. Besides that, one can also improve his/her teamwork skills in order to reach the higher level of DOTA 2. For highly skill games, DOTA 2 players are required to learn how to collaborate in a team to achieve their goal of defeating the opponents. A team with less individual brilliance but with better teamwork is the one with the higher chance to win the game against a team consisting of multiple brilliant players but with bad teamwork. Once you learn how to play well with your team, the whole DOTA2 experience will transform into a more enjoyable one. DOTA 2 may seem to be just a game to someone, but for me playing DOTA 2 is like solving a problem. You will encounter many problems occurred during your match : the combat may not go as well as you think it will, the match is progressing in a way you don’t expect or your team is losing the advantage, .etc. In order to solve all these problems, you will need great problem solving skills. Some of it will come from your own experiences with the game, that’s why you can see during professional games, the more experienced team will be better in handling unfavorable situations and being flexible in their strategy change in the middle of the game. There’s also a research paper on identifying patterns in combat that are predictive of success in MOBA games. Basically from the abstract from the paper said: “We model combat as a sequence of graphs and extract patterns that predict successful outcomes not just of combat, but of the entire game. To identify those patterns, we attribute features to these graphs using well known graph metrics. These features allow us to describe, in meaningful terms, how different combat tactics contribute to team success. We also present an evaluation of our methodology on the popular MOBA game, DotA 2 (Defense of the Ancients 2). Experiments show that extracted patterns achieve an 80% prediction accuracy when testing on new game logs.” This is one study to show that playing DOTA 2 is actually trying to solve problems, if you find the solution or any part of it, you’ll have more advantages in winning the game. DOTA 2’s main endogenous value lies on its cosmetic items. You can get skins for your heroes either by playing or buying from the steam market. Although skins only affect the cosmetic look and in no way affect the heroes’ abilities or empower the player, it is one of the most powerful features of DOTA 2 that keeps the players interested in the game. Some skins will not only grant different to the heroes but also has new, more flashy looking visual effect on the heroes’ skills. There are also Steam Workshop where you can design and submit your own items/heroes design to Valve and let them assess your design too. DOTA 2 is an extremely fun game. It is the most engaging game that I’ve ever played for such a long time. And most importantly, I do not get bored of it. There are just countless possibilities for every single game. A person who has never played DOTA 2 would say that the game sounds repetitive since your only objective is the kill the opponent’s throne for every single game. However, due to the uncertainty of every game, it’s always fun to play DOTA 2. 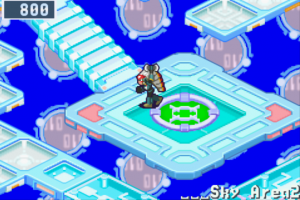 Megaman Battle Network 6 <Cyberbeast Falzar> is the last series of the Battle Network game designed for Game Boy Advance. This is RPG game where the player will take the role of a 6th grade boy in the world where a virtual partner ‘NetNavis’ is essential to everyday life. Lan will work with MegaMan.EXE (a Navi combined with Lan’s identical twin-brother DNA) to stop WWW from their evil plots and destroy the dangerous Cybeasts before they destroy the Net. Targeted for Game Boy Advance but is able to be simulated on Windows. Lan: To explore the map and interact with other characters in the ‘real world’. Megaman: To explore and interact in any Network and battle other evil Net Navis and viruses. Link Navis: Other Navis that have their own special attacks that can be controlled by the player but the Network they access to is fixed. Each of them have special moves that allow the player to remove obstacles either for side quests or for the main story line. The battle game play is solely on a (3-length x 6-width) board where the player is given x number of battle chips / cards each turn which he can use to attack the enemy. The basic enemy does not have any Artificial Intelligence but each of them works solely on their set of attack cycle which makes the game play easier and more predictable. Off-battle strategy will involve deciding the battle chips the player want in his folder depending on its MB and restrictive customization in Navi Customizer to install programs or risk of bug. 2D pixelated art. Personally I love the graphics a lot. There are a lot of cute sprites. This make me feel very interested to explore and interact with the environment. I love the sound they used like the bell ring to signify after class, or a fast paced music to create suspense to remind the player about attack by an enemy.
.:: Lens of Reward ::. There are constant reward in the game play. At every end of a battle, you will get a reward based on your battle time. The reward increases when the difficulty of the viruses goes up. 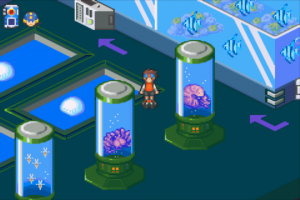 During each move in the battle, if the player targets the viruses at a certain timing, the player will get a x2 boost to its immediate attack. Completing the story line at your own target allows you to unlock the next story. Exploration is encouraged in the game by discovering random rewards around the map. There are special rewards, hidden bosses and NPCs giving special rewards who are hidden at some corners of the map. Side quests open up new maps that the user can explore and gain rewards. The rewards are meaningful that allow user to earn zennies to buy chips and programs; battle chips to improve battle and custom programs to improve attack, special moves or add interaction to the user like saying jokes. Player who collected too many of the same chips can exchange them for a random chance to get a rare chip. Collecting all the chips will allow the player to unlock a special hidden map.
.:: Lens of Time ::. Personally I feel that the game is paced really well. For a person who wants to complete the story quickly, the player don’t need to put too much efforts into training to unlock the next story to complete the game. Alternatively, if players who want experience and play the game to the full, the player can explore the map at any point of time and collect battle chips and complete side quests. Compared to previous versions of battle networks, the time paced of the battle experience is better paced. Since the battle is ‘real-time’ and you only have choice to pause the game to select battle chips after a period of time, a better paced game will give players of different level of experience a better game play experience. In the game, there is a board where the player can apply to do side quests. Some of the quests requires rare battle chips or need certain quests before they can be applied.
.:: Lens of Story ::. The game is heavily dependent on story line. Personally, I am very interested in the story of the game. I’ve played Megaman Battle Network from 4 until 6. I have developed some feelings for the character. In the game reviews that I have read online, a lot of players were more interested in unlocking the story line to know the final ending to megaman battle network. I have seen a great improvement in the aesthetics of the game and the repetition of the ABC map which makes me feel familiar and more interested in the final ending. After I finished the game, I got this sad feeling of I wish there could be more game play of Lan and Megaman. It make me feel interested in completing all the side quests and repeat the game.
.:: Lens of Freedom ::. Unfortunately, this game does not allow a lot of freedom. New maps is only unlocked when the story progresses. I feel constraint at times and wish that I could battle new viruses without going through the next storyline. However, the restriction of freedom by showing the possible maps but unreachable is also a way to create a ‘wait factor’ for players to feel suspense. On contrary, I feel that if I gain too much freedom in the map and battle viruses in future maps, I might get bored to battle the same viruses again as the story progresses. Though, it might be even more exciting if there are more maps and networks to explore. 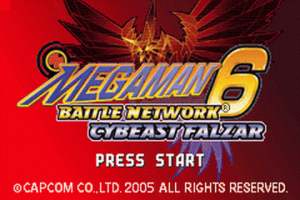 Megaman Battle Network 6 Cybeast Falzar is a easy game to pick up to play and allows different genre of players to spend sufficient time to immense in the game. Neopets allow players to rear virtual pets called Neopets and explore the virtual planet, that Neopets inhabit, named Neopia. Players are expected to feed and care for their Neopets when they get hungry or ill. They can also interact with their pets using items such as books or toys purchased with virtual currencies known as Neopoints which can be earned through playing games. 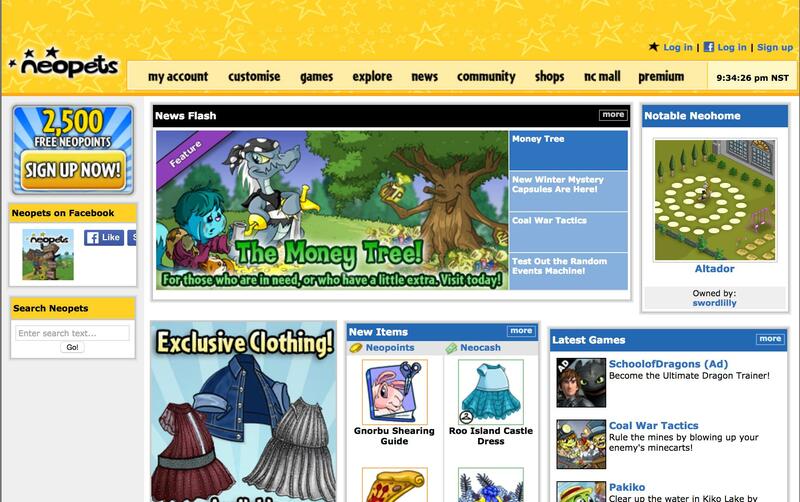 Neopets was launched in 1999, where user can play with just a web browser and Adobe Flash Player. The technology used was simple and remained so till date. This thus eliminates problems such as lagging and would cater to most players. Neopets was targeted at kids, hence the mechanis was simple but yet is a reflection of the real world. Players will have to earn money through playing games to purchase items such as food and medicine to care for their virtual pets. Money can be placed in the bank and interest can be earned. 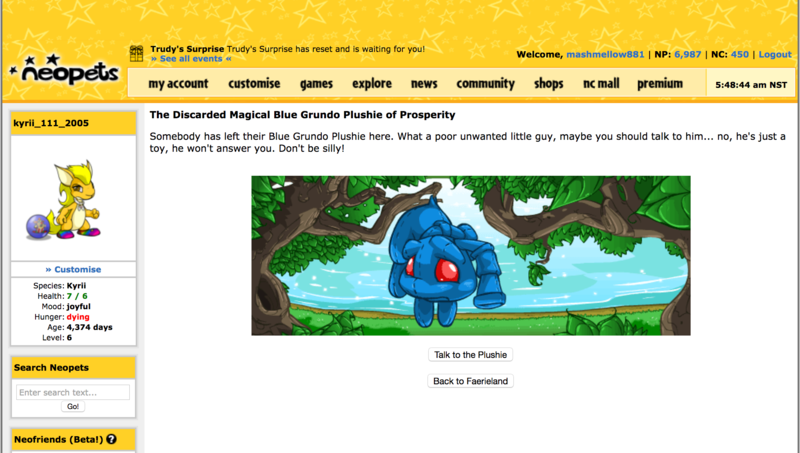 Players are also able to build customizable houses known as Neohomes for their Neopets. There are also different themed lands on the planet which players can explore. Each themed land has their own games, attractions and shops. Neopia runs on its own calendar, economy and stock market. Neopets has cartoony 2D graphics that is suitable for all ages. While navigating between different pages, the ‘Something has happened!’ box may appear at the top of the page randomly, but not often. It may bring unexpected fortune or misfortune upon the player or it simply does not have any impact. Players are unaware of such a situation beforehand. Sometimes, it may bring super rare items to the players and this is where the element of suprise comes in. In Neopets, there are certain items that are available for free once per day per account. 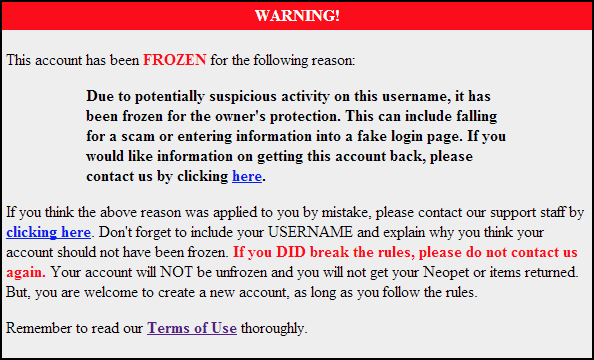 If users are found to make duplicate accounts to exploit this system, users will have their accounts frozen. The items and Neopoints will not be returned. 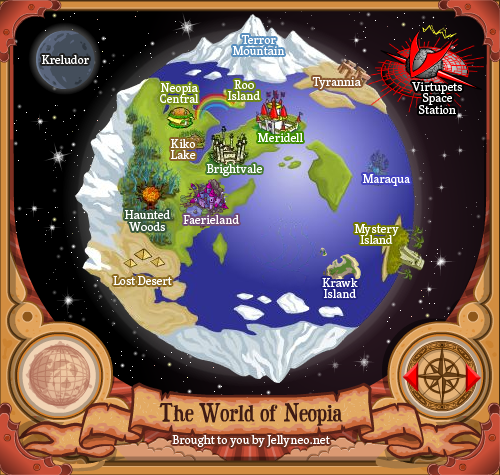 There are some hidden locations and gameplay in Neopets which cannot be found on the map itself. These gameplay are usually magical and can provide the user with benefits. There are many themed islands on Neopia. Each island has different attractions, shops and games. It mainly fulfills the fantasy of children whom wants to live in a fairy land, underwater or in a haunted woods. Overcooked! is a cooking simulation game developed by Ghost Town games. 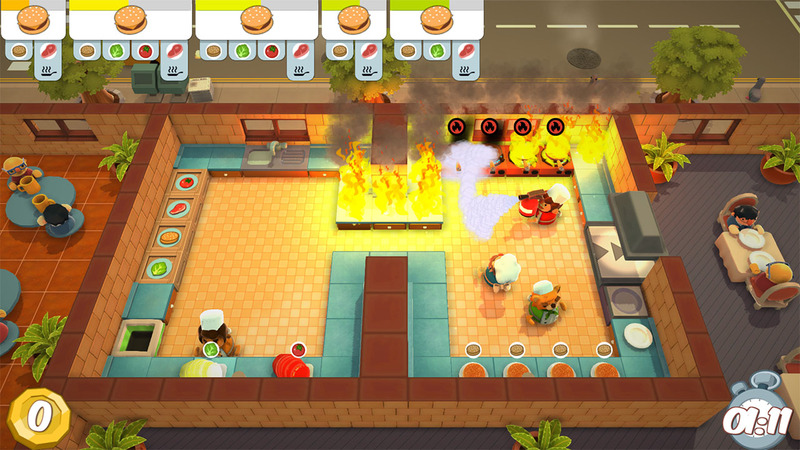 In either single-player or local cooperative or competitive mode, players control a number of chefs in various hazard-filled kitchen levels and aim to fulfil food orders as rapidly as possible. 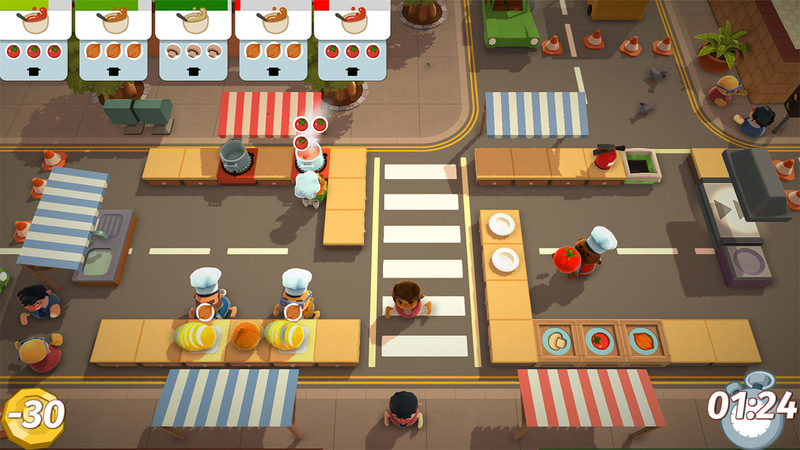 Players must cooperate to complete recipes and earn points within a set amount of time in one of numerous kitchen levels. Players must pick up ingredients, put them down on chopping boards to chop them, then place them into cooking devices such as pots or ovens before serving them. Each level has its own set of obstacles that requires players to devise strategies to complete the orders as efficiently as possible. In competitive mode, players play against each other in side-by-side kitchen levels to earn the most points. The game is rendered colourfully in stylized low-polygon 3D, with cute character designs and simple, responsive animations that make the hectic gameplay feel more immersive and exciting. The user interface is pared-down and usually absent, using only icons and graphics to instruct users on the steps needed to complete new recipes. The story of the game is simplistic and has little bearing on game mechanics: the players are transported back in time by the Onion King to learn how to cooperate well as chefs in order to defeat a giant, apocalypse-causing spaghetti monster. Overcooked was made in the Unity game engine and can support up to four controllers, and most interestingly, Shared Controller Mode where a single controller can be used for two players. The game’s fun factor largely stems from the chaotic cooperation between players, who in local co-op, are likely sitting near each other and can interact both in real life and within the game. Playing the game becomes a bonding and socializing experience with their friends. 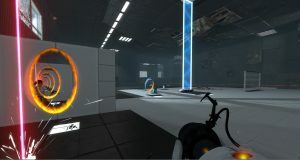 The skill tested most in this game is in single-player mode, the ability to multi-task, and in co-operative mode, the ability to cooperate with their fellow player. The basic actions in the game such as assembling the recipes are all done with a single button push, but completing the recipes with the other players requires a modicum of skill in communicating effectively and collaboration. After replaying certain levels, players will devise strategies and become more skilled in navigating them. Levels get more challenging as play goes on. Earlier levels only introduce one type of obstacle at a time, for example, rats which will steal ingredients or earthquakes that cause parts of the map to become inaccessible. Later levels ramp up difficulty by combining these obstacles, causing players to have to restrategize. As the game only allows local co-op, players must communicate by talking to each other and can do so at all times. 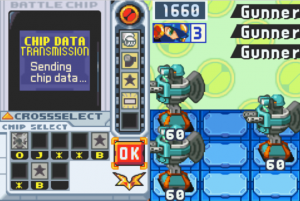 All players have the same abilities, but in some levels, players may be split up and only have access to certain kitchen equipment, requiring them to co-operate by passing each other items on conveyor belts or opening doors by standing on a button. Completion of each level earns players 0 to 3 stars depending on their performance. The next level can only be unlocked if players have obtained 1 star for the previous one, but later levels require also an additional number of stars for players to proceed. This is a rather frustrating way to gate later levels from players who may just be bad at dealing with a certain map’s obstacles and are not keen on replaying earlier levels to obtain more stars. Onmyoji is a mobile CCG-Corporate Community Game and RPG-Role Playing Game where players engage in part real-time, part turn-based combat with characters in the form of cards. The game story is based on the traditional folklore of Abe no Seimei, who was a famous onmyoji in the middle of the Heian Period in Japan. The game portrays a world of Yin and Yang with a rich collection of character cards. Player can use card to summon spirits with varying abilities, involve in 3D battles to train and level up their characters, and gather resources to evolve them. In terms of aesthetics, the game provides a smoothy and soothing environment. The combination of background colours bring warmth to players. Both the visual style and culture elements originated from Japanese Hyakki Yagyo story. The traditional Japanese character design plus high quality illustrations, together with the excellent voice acting, set a new visual and aural standard for the anime mobile game. The game also uses Location Based Service Networking to assist in 3D game play. The game attempt to foster strong community involvement by using Location Based Services Networking. Player can choose to play with those geographically around him. They can add friends and send love to each other, form team to beat the strong spirits, or even donate some spirits to other friends in need. There are occasional community events as well, when player can invite other friends to join the game experience, and earn himself some credits. The game manages to maintain a balance between the player’s frustration and happiness. If the player did not summon the character from the strongest category “SSR” for 100 times, the player will receive a special reward, which is kind of both humorous and sarcastic. Upon the completion of one chapter, the game will give you a glimpse of what is coming in the next level, as well as the reward for completing the next level. In this way, the player will always be curious and aroused to player even harder. In terms of character transformation, characters in “SSR” , “SR” and “R” category can be awaked by collecting several necessary materials. After the evolution, the character will be stronger in battle or even acquire a new skill. However, since each character can only be awaked once, the character transformation thereafter is to simply level up their skills. Many players may feel bored as the characters after being awakened are no longer providing any surprise to them.